The BEVA Equine Welfare Award, sponsored by Blue Cross, was presented to Roly Owers, veterinary surgeon and Chief Executive of World Horse Welfare. As Chief Executive of the charity since 2008 Roly has driven forward many major initiatives for the horse industry, most having a direct impact on animal welfare and disease prevention or control. He has used his position to develop programmes across the Equine Sector and has provided much needed dispassionate and effective leadership. His key achievements include the establishment of the Horse Crisis group of charities, a successful campaign for the Control of Horses Act, the production of guidelines for transporters, including feed and watering stops and total travel time allowances and a successful refinement of the Tripartite Agreement, which controls the movement of horses between Ireland, UK and France. The BEVA Richard Hartley Clinical Award was given to Dr Annette McCoy for the paper ‘Short and long-term racing performance of Standardbred pacers and trotters after early surgical intervention for tarsal osteochondrosis’ by A.M McCoy, S.L Ralston & M.E McCue. The article was first published online in July 2014 and then July 2015, Volume 47, issue 4 of the Equine Veterinary Journal (EVJ). 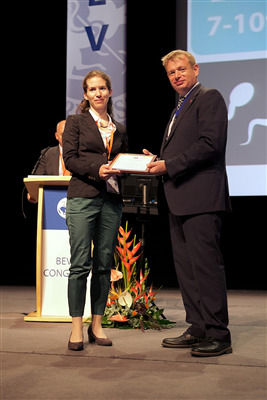 The BEVA Trust Peter Rossdale Equine Veterinary Journal (EVJ) Open Award was presented to Dr Franziska Wohlfender for the paper ‘International online survey to assess current practice in equine anaesthesia’ by F.D Wolfender, M.G Doherr, B Driessen, S Hartnack, GM Johnston & R Bettschart-Wolfensberger. The article was first published online in April 2014 and then January 2015, Volume 47 of the Equine Veterinary Journal. This year’s BEVA Award winner is Ellen Paulussen DVM for her paper on ‘Radiographic and Ultrasonographic Evaluation of the Esophagus in the Horse’. Ellen’s presentation won the award at the Voorjaarsdagen Congress in April 2016; she will present it again during the Clinical Research Sessions at BEVA Congress. The reciprocal Voorjaarsdagen Award winner will be selected from those presenting Clinical Research papers at this year’s BEVA Congress. Their prize will be free registration to Voorjaarsdagen Congress 2017 where they will have the opportunity to present their paper again.